With my slight beauty addiction (slight...I say...slight!) it's quite impossible to use everything all the time. It's always fun stumbling across an old favourite and fallen back in love with it and recently I seemed to have fallen into a deep hole of them. Such an awesome hole in fact that I obviously, being me, wanted to write a post all about them! This is such a high school classic for me! I LOVED this as a teen and a few years ago I asked for a bottle for Christmas..... which I had kind of forgotten about if I'm totally honest - until last week. Deep Red is literally the perfect winter scent - I've been using it everyday and I have been getting some many questions about it! This is going to be my go-to for the rest of the season! I'm not going to lie.... I have 3 of these. 3. Sat in a drawer! I bulk bought them when they first came out as I was so scared they were going to be limited edition that I didn't want to run out as I loved it so much. Such a gorgeous purple (and they were a total bargain at just £2.99 each!) - I can't believe I'd forgotten all about it - I can safely say there's one sat in my handbag now! I actually repurchased this recently as I got it for an amazing price.... half price in fact! I love this serum, I pop it on every night before moisturising and it leaves my skin feeling great, especially in this horrible climate at the moment! The only reason I had stopped using it was because of the price so I will be making this tube last as long as I can. Ooooo this is a drugstore beaut! I just love the scent of Nivea products and this had been shoved to the back of my skincare for far too long! I hate the feeling of my skin without toning - it's like a must-have refreshing step for me after cleansing! Have you stumbled across an old favourite recently? It's crazy how much stuff I forget about! Oh I loved Deep Red as a teenager too! The smell of it always reminds me of my last year of high school. My friend bought me a bottle a couple of years ago for nostalgia and I'm so glad she did! ooo I love Hyaluronic acid, I have a little GEEK OUT over it every time there's a new product! It hold up to 60 times its own weight in water, so it is super hydrating on skin. AND it's skin identical.. your skin has it anyway, so it works really well... love it! 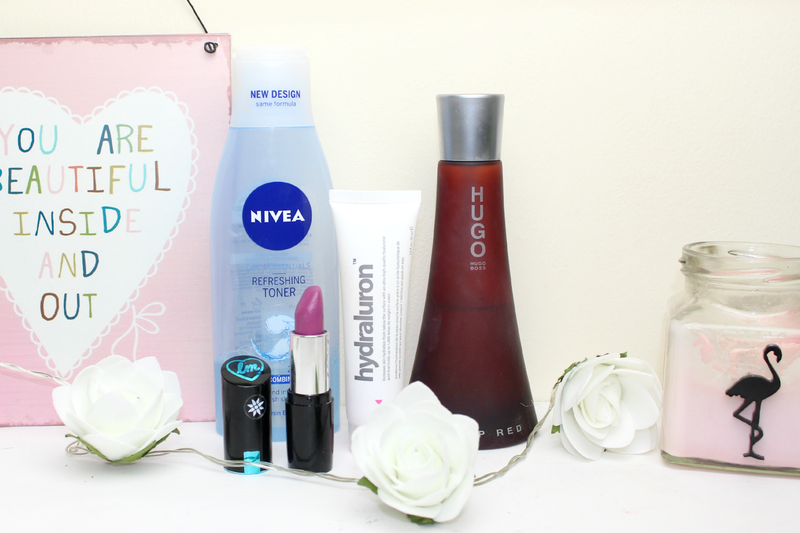 the nivea toner is one of my favs for sure! I cannot live without it! I can't believe I haven't tried Hydraluron, I need to! I've used the Nivea Cleanser before and was really impressed so I'll have to try the toner. Love the refreshing feeling!